Longtime Drunkard favorite Page France will be releasing an album via Suicide Squeeze on May 8th, and (you guessed it) fresh from a string of dates at SXSW, are now making their way up the West coast. If you are unfamiliar with the Maryland based group, imagine the folkier elements (Neutral Milk) of the Elephant Six Collective and you’re on the right track. Below are two tracks off The Family Telephone, and two from 2005’s excellent Hello, Dear Wind; which was one of my favorite albums of that year. 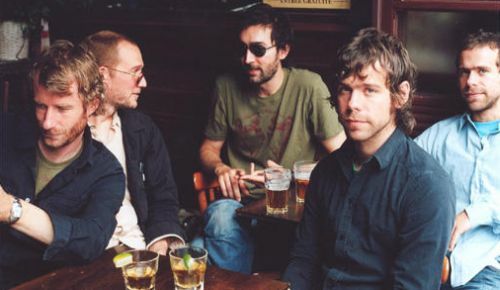 ALSO: If you haven’t heard it yet…yesterday, The National unveiled the first MP3 off their upcoming album The Boxer (due out May 22nd). Could not be more excited for this release, as Alligator remains my favorite album of the last two years. this is a great heads-up! THESE GUYS LOOK LIKE SLIME ! I have been in love with “Sad Songs for Dirty Lovers” for a couple weeks now. I haven’t been able to get into “Aliigator” as much, although I think it is very good. Jeez louise, that National song is good. I just sat here and listened to it about 4 times through and wow. I slept on Alligator back in ’05 and I’m still kicking myself over it. I will not make the same mistake this year. yeah, when somebody puts out a better record than Alligator, my mind will be blown. it has yet to happen since.